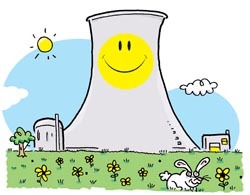 Let's Have Some Love for Nuclear Power - WSJ.com: "All over the world, nuclear power is making a comeback. British Prime Minister Gordon Brown has just commissioned eight new reactors, and says there's 'no upper limit' to the number Britain will build in the future. German Chancellor Angela Merkel has challenged her country's program to phase out 17 nuclear reactors by 2020, saying it will be impossible to deal with climate change without them. China and India are building nuclear power plants; France and Russia, both of whom have embraced the technology, are fiercely competing to sell them the hardware."